The Countdown to the 2012 Olympics is On! 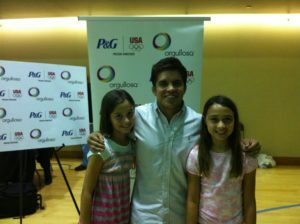 On June 20, Los Tweens and My Los Tweens attended the kickoff event for P&G and Orgullosa’s partnership with Olympic Gold Medal Wrestler Henry Cejudo and his mom Nelly Rico. Their goal is to raise $500,000 for the P&G/Team USA Youth Sports fund that supports athletic programs across the country. Henry started the event by hosting a short wrestling clinic for a group of Miami teenagers. The exercises were followed by a brief press conference introducing the campaign and Henry and Nelly’s story. Nelly is a Mexican immigrant who came to the U.S. seeking a better life. She worked numerous back-breaking jobs to feed and clothe her children. Henry didn’t grow up in the best circumstances but through sports he found an outlet and a safe haven. The same hard work he saw his mother put into her jobs, Henry put into wrestling. It paid off. He won the gold medal in the 2008 Beijing Olympics. Henry and Nelly tell the story best in their video on the Orgullosa web site. There are a number of children similar to Henry that could benefit immensely from extracurricular sports activities but don’t have access to them due to financial hardships. That is why supporting causes, like P&G/Team USA Youth Sports fund, which create these opportunities for tweens and teens is extremely important. The earlier kids get started and motivated by sports- the better. And we believe that having kids watch the upcoming Olympics can be inspiring for so many. The event wrapped up with interviews and our My LosTweens young reporters had the opportunity to speak to P&G’s Vanessa Valentina Silva and Henry himself! View their interviews and video from the event below. LosTweens is happy to share how you can help Henry and Nelly reach their goal: Redeem the coupons from the P&G Youth Sports brandSAVER being distributed in newspapers across the country on July 1st and visiting www.orgullosa.com/we-support. You can also find more information on Orgullosa, P&G’s initiative that celebrate the Latina woman, by visiting www.orgullosa.com or view the video from the event. Make sure and keep or get your ‘chicos‘ active this summer- we want to celebrate more Olympic dreams in the near future! Remember to share your kids sports stories on our Los Tweens Facebook page. 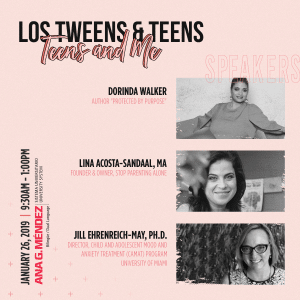 This entry was posted in Raising Tweens and tagged culture, familia, Family, Henry Cejudo, Mami, Multicultural, Nelly Rico, Olympics, padres, Parenting, sports, Teen, teens, Tween, wrestling, youth. Bookmark the permalink.